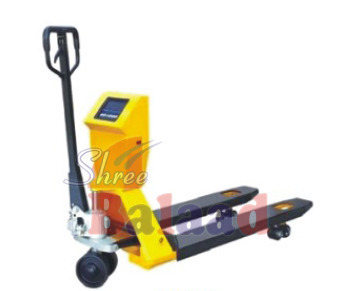 We are a leading Manufacturer of heavy duty hand pallet truck, high lift pallet truck, mobile floor crane, hydraulic hand pallet truck, electric pallet truck and electric floor crane from Ahmedabad, India. Fork Lowering speed is controllable, operated by foot pedal. Ergonomic rubber wrapped handle, which is comfortable and convenient to operate. Entry / exit roller, more freely travel. Equipped with over-load valve, with long service time. Adjustable pump cap ensures a long service life. 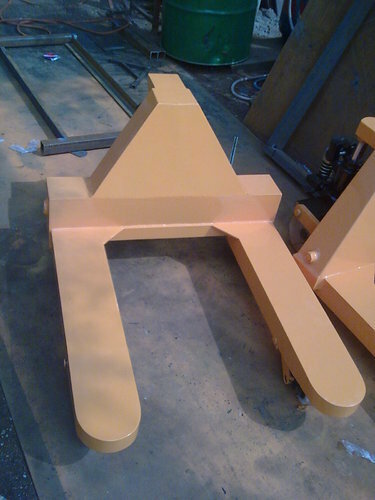 Remark: Special size for width and length can be made according to customer’s requirement. 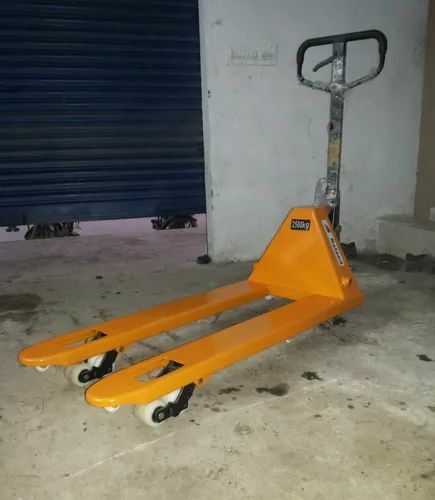 We are offering High Lift Pallet Truck to clients.We hold expertise in presenting an extensive series of High Lift Pallet Truck. When raised, the truck locks itself to the floor with extended outriggers; this, coupled with a long wheel base, makes the truck particularly stable. 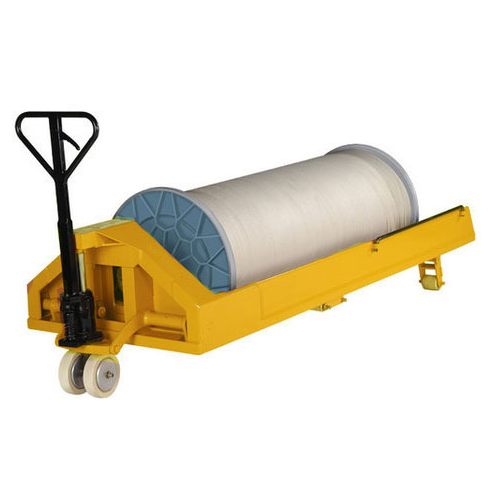 200 mm diameter, UHMW-PE steer wheels and UHMW-PE load rollers combine to make the truck extremely easy to maneuver. Heavy Duty ball bearings for lover maintenance. Highest quality seals & wipers. 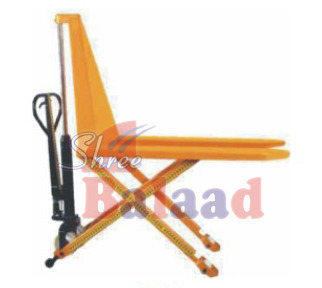 Available options: special fork length, width, wheels as per requirement. Overall length 1450 to 2100 mm. Over all width 1000 to 1500 mm. Over all Ht 1550 to 2100 mm. We are passionately engrossed in manufacturing and supplying an exclusive array of Mobile Floor Crane. Lowest Hook ht 300 to 500 mm. Highest Hook ht 2000 to 4500 mm. Min Boom length 1000 to 1200 mm. Max Boom Length 1550 to 1900 mm. 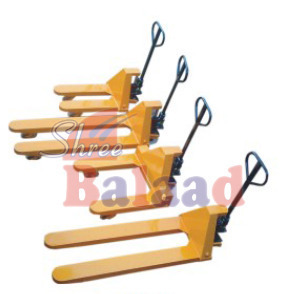 We are engaged in providing optimum quality Hydraulic Hand Pallet Truck. The range of products is well checked on specific parameters to ensure that it is in compliance with the international standards. 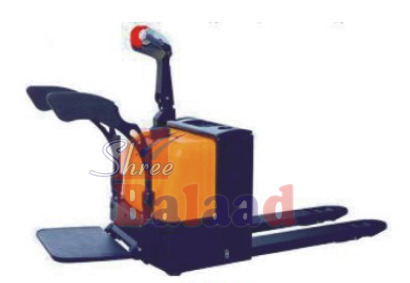 Fork Lowering speed is controllable, operated by hand control and foot pedal. 3 position hand control – Raise, Lower, Neutral. Ergonomic large rubber handle with three control lever. Capacity 2200 Kgs & 3000 Kgs. 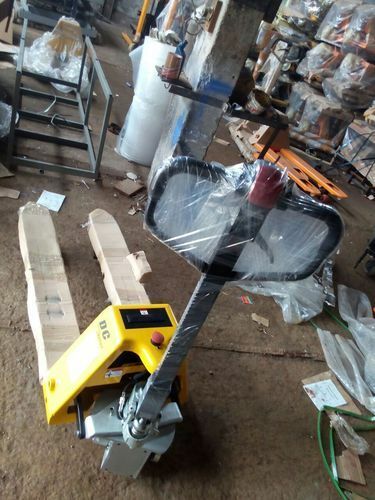 With great conceit, we introduce ourselves as one of the foremost manufacturers and suppliers of excellent quality of Electric Pallet Truck. 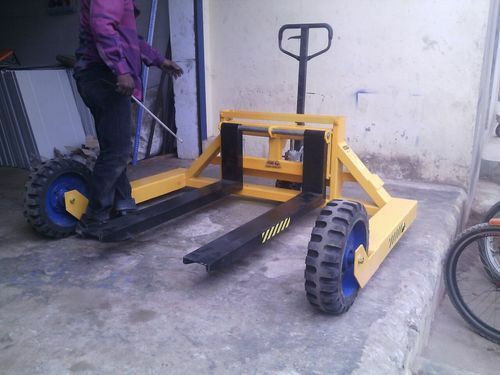 Robust construction, tandem wheels, low service cost. 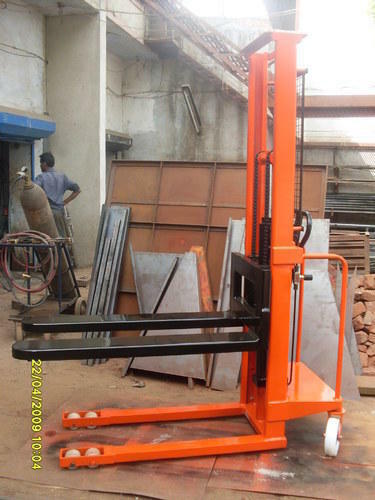 Available capacity: 2200 Kgs & 3000 Kgs. 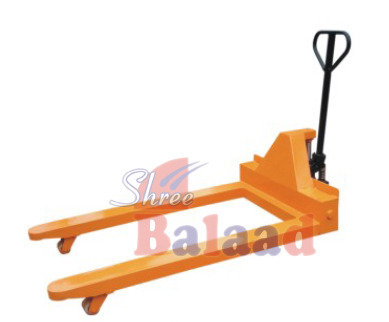 Available options: special fork length, width, wheels & capacity as per requirement. 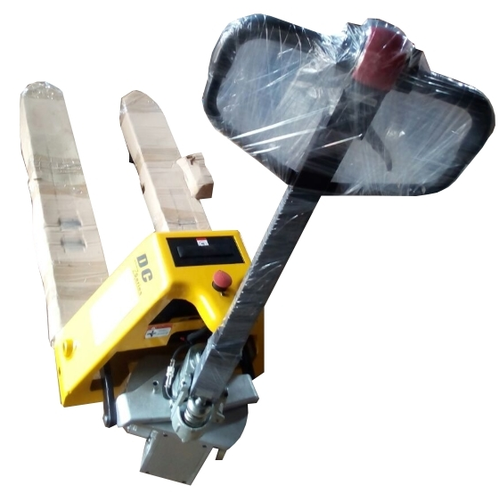 We are offering Heavy Duty Hydraulic Hand Pallet Truck to clients.Offered range is carefully manufactured with extreme perfection under professionals' guidance by using top grade quality raw material and with the use of contemporary technology in line with the set industry norms. Capacity: From 2.5 Ton To 5.0 Ton. Size: As per Clients Requirement. Widely used in carrying meat,Pharamcuetical products , marine products,wines,beverage,chemicals,etc. and can work in very low temperature conditions,e.g. to deliver goods into and out of freezers/coolers. 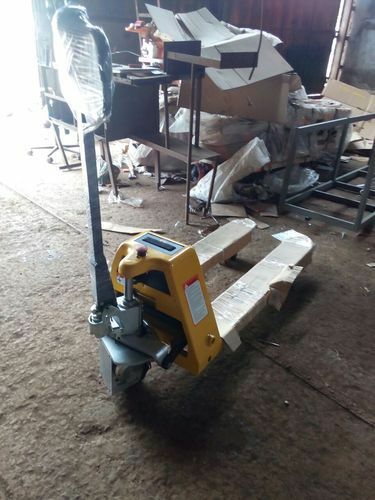 Mobile pallet truck with scale combined two major functions for pallet truck/scale, allows you to weigh cargo whatever,wherever, whenever you want. Power supply with rechargeable battery or with 88~264V AC input. Keypad and automatic tare functions. 1.2inches,super-large and bright LED display in solid state to be strike-free. A/D velocity:27/s,a faster speed of weighing,more correct. Various functions: with extended functions as weight-checking,counting,ect., to satisfy different needs of customers. 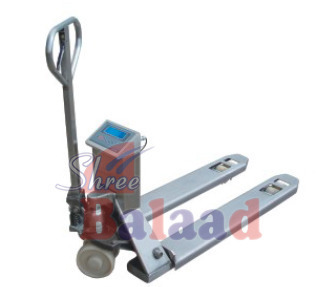 We are engaged in manufacturing and supplying a wide range of paper Reel-Beam Pallet Truck. 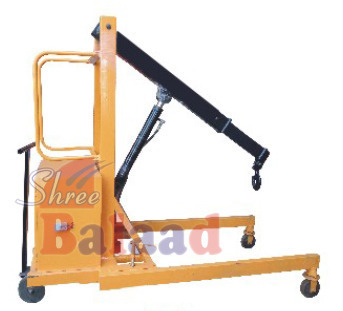 For easy & smooth movement of warp beam or rolls. 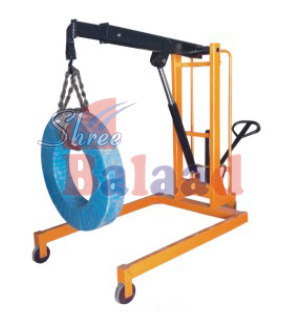 Suitable for transporting, full or empty beam in loom area or beaming section. Beam flanges are resting on the trolley while transporting. Suitable for beam width up to 3800 mm, beam flange diameter from 800 mm to 1250 mm. We are the leading supplier ofHand Pallet Trolleymade available to our clients at competitive prices. 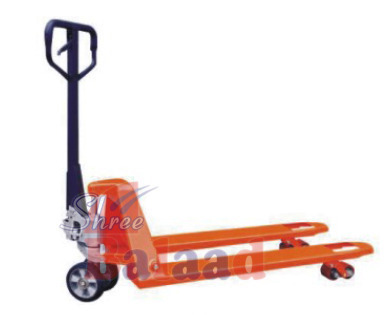 We are the leading supplier of Hand pallet trolleymade available to our clients at competitive prices. 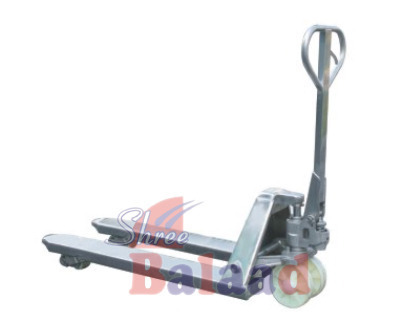 Looking for “Hand Pallet Truck”?